The year is sure starting off with a bang, bringing with it a whole slew of new green tech to be unveiled at the 2012 Consumer Electronics Show (CES) in Las Vegas. While past years have been a little thin when it comes to eco-friendly tech, this year's show promises to be packed with innovative green gadgets. After a little bit of sleuthing, we've managed to get a sneak peek of some of the coolest designs set to make a statement this week in Sin City. 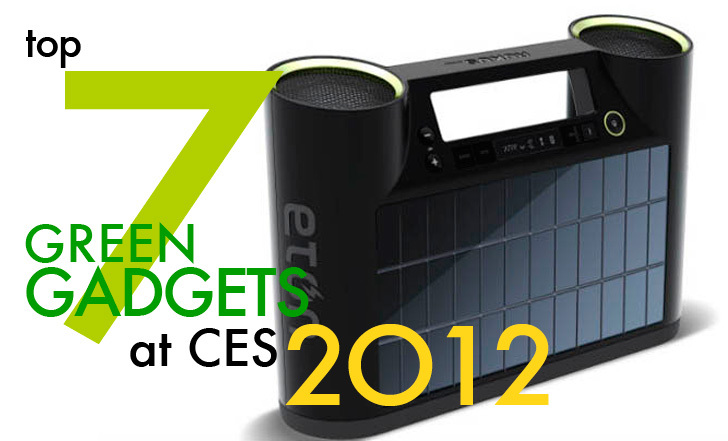 From a solar sleeve to power and protect your Kindle to an incredible Eco ATM that gives you cold hard cash in exchange for recycling your unwanted electronics to a low-energy 22-inch HD USB-based monitor from AOC, hit the jump for 7 of our favorite picks -- and be sure to keep checking back for more as we report on all the latest and greatest at CES 2012! Get your jam on basically anywhere you want with Eton’s new, heavy-duty, portable Bluetooth speaker, the Rukus. The device is powered by an enhanced monocrystal solar panel, and the speaker can wirelessly stream music from any Bluetooth-capable device. It also has a built in handle that makes transporting easy, and can charge almost any mobile device. While many are keen to the negative impact of e-waste, there are still plenty who aren’t privy. With little incentive to properly dispose of unwanted electronics, many people end up throwing their goods into the trash which end up in landfills and pollute the earth. The Eco ATM gives consumers a reason to recycle their e-waste by offering them cold hard cash in exchange. The Eco ATM is an automated self-serve kiosk system that uses advanced machine vision, electronic diagnostics, and artificial intelligence to evaluate and buy-back used electronics! Like to walk around without socks in the winter? Can’t stand your room overheating at night? The Nest knows. This thermostat learns your preferences and tries to provide your spaces with the perfect temperature at various times of day. It’s the ultimate in comfort, and will help you save on energy costs. Wagan Tech, a developer and manufacturer of portable power supplies will be showcasing its Solar e Power Case 450 and Solar e Power Cube 1500 solar power generators at CES this year. Both the Solar e Power Case 450 and Solar e Power Cube 1500 generators can be set up easily and rapidly, and feature an AGM/gel hybrid battery, solar panels and Wagan’s legacy power inverters. 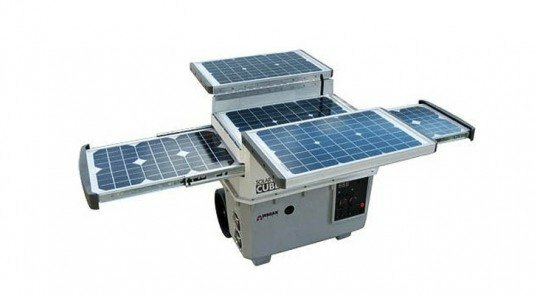 The 450 boasts a 40 W solar panel unit, a 26 AH battery and a 450 W inverter all packed in a rugged case. The 1500 delivers more power with a 55 AH battery and a 1,500 W AC inverter packed in a wheeled, rugged case. The generator has solar panels that provide 80 W of energy to the battery. After years in the making, the One Laptop Per Child program’s XO-3 tablet will finally make its debut. The tablet runs at only $100 and boasts an 8-inch, 1024 x 768 3Qi display for power savings and e-paper-like capability. Solar panels, hand cranks, a bigger battery, and other accessories will also be available. Unfortunately, unless you’re a country, you won’t be getting yourself one of these. They’re being sold in bulk into education systems starting this year, and will not be available to the average consumer. There’s no need to worry about your Kindle going kaput mid “page” anymore. This week, SolarFocus Technology Company will introduce the SolarKindle, the world’s first solar powered e-reader cover. 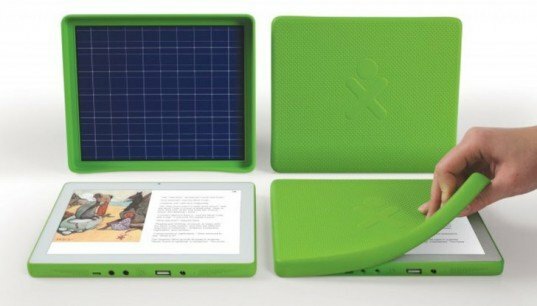 The SolarKindle features a unique eco-friendly design with a flexible, lightweight high performance solar panel built right into the cover, and a dual-charging (USB/solar) reserve battery that greatly extend reading time — it guarantees three-months of unplugged use! In addition, the built-in LED reading lamp can be powered continuously for up to 50 hours without using the Kindle’s main battery. 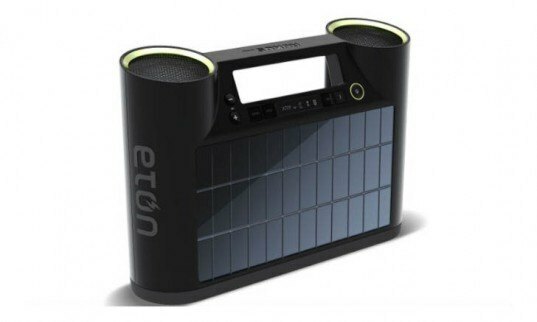 Rukus Bluetooth Solar-Powered Speaker Get your jam on basically anywhere you want with Eton’s new, heavy-duty, portable Bluetooth speaker, the Rukus. The device is powered by an enhanced monocrystal solar panel, and the speaker can wirelessly stream music from any Bluetooth-capable device. It also has a built in handle that makes transporting easy, and can charge almost any mobile device. While many are keen to the negative impact of e-waste, there are still plenty who aren't privy. With little incentive to properly dispose of unwanted electronics, many people end up throwing their goods into the trash which end up in landfills and pollute the earth. The Eco ATM gives consumers a reason to recycle their e-waste by offering them cold hard cash in exchange. 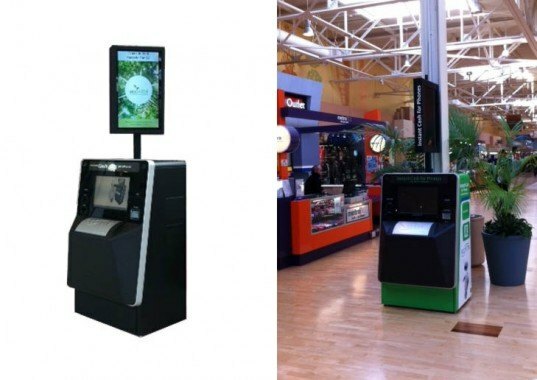 The Eco ATM is an automated self-serve kiosk system that uses advanced machine vision, electronic diagnostics, and artificial intelligence to evaluate and buy-back used electronics! 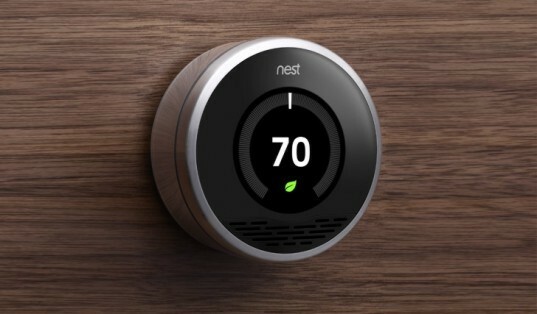 Nest Self-Programming Thermostat Like to walk around without socks in the winter? Can't stand your room overheating at night? The Nest knows. This thermostat learns your preferences and tries to provide your spaces with the perfect temperature at various times of day. It’s the ultimate in comfort, and will help you save on energy costs. Like to walk around without socks in the winter? Can't stand your room overheating at night? The Nest knows. This thermostat learns your preferences and tries to provide your spaces with the perfect temperature at various times of day. It’s the ultimate in comfort, and will help you save on energy costs. AOC will introduce a 22-inch monitor (e2251Fwu) that draws its power and signal through a USB port. Retailing at $199, the plug-and-play panel iwill support a 1920 x 1080 resolution @ 60 Hz, and will be compatible with Windows XP / Vista / Windows 7 & Apple MAC OSX Tiger / Leopard and Lion -- Linux support is also available through many of the standard distributions. The display will also be HDCP compatible and have an ultra-slim form factor, measuring just 10.6-mm thin. 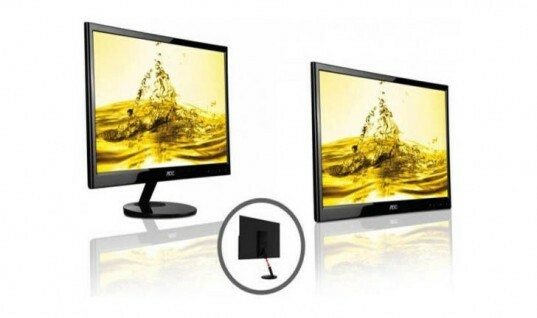 "Every AOC monitor is manufactured to meet the most stringent green standards," the company said. "Along with being mercury free, the packaging for the eco-friendly 22-inch USB Monitor is made from recycled materials. In addition, AOC’s industry-leading LED display technology allows for a powerful and crystal clear display while minimizing power consumption." After years in the making, the One Laptop Per Child program’s XO-3 tablet will finally make its debut. The tablet runs at only $100 and boasts an 8-inch screen — traditional LCD, though it may be upgraded to a Pixel Qi display for power savings and e-paper-like capability. Solar panels, hand cranks, a bigger battery, and other accessories will be available. More of the device's specs will be revealed this week. There's no need to worry about your Kindle going kaput mid "page" anymore. This week, SolarFocus Technology Company will introduce the SolarKindle, the world’s first solar powered e-reader cover. 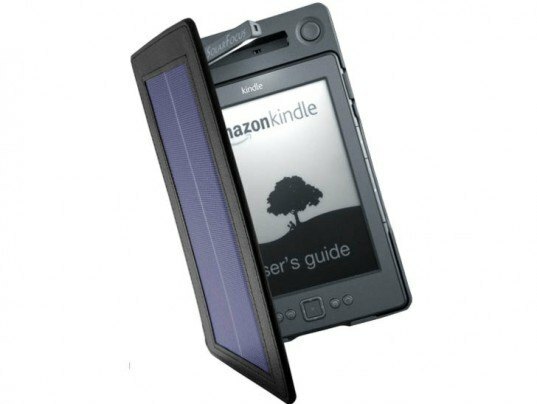 The SolarKindle features a unique eco-friendly design with a flexible, lightweight high performance solar panel built right into the cover, and a dual-charging (USB/solar) reserve battery that greatly extend reading time -- it guarantees three-months of unplugged use! In addition, the built-in LED reading lamp can be powered continuously for up to 50 hours without using the Kindle’s main battery.